Welcome to ReachMD. You are listening to Lipid Luminations, produced in partnership with the National Lipid Association and supported by an educational grant from AstraZeneca. Your host is Dr. Alan Brown, Director of the Division of Cardiology at Advocate Lutheran General Hospital, and director of Midwest Heart Disease Prevention Center at Midwest Heart Specialists at Advocate Healthcare. You’re listening to ReachMD, and this is Lipid Luminations, sponsored by the National Lipid Association. I’m your host, Dr. Alan Brown, and with me today is nurse practitioner, Joyce Ross, who, just at this meeting, became President of the National Lipid Association. She is also a consultative education specialist in the cardiovascular risk intervention with the University of Pennsylvania Health System. Joyce, I know that today we’re going to focus on the obesity epidemic, but I think it’s testimonial to what a great organization the NLA is that as a nurse practitioner who has participated on almost every committee and been a very active member of the National Board that you’ve been recognized and that it’s the type of organization where a “non-physician” can become president. And I just think, obviously, you will be a fantastic president, but I just wanted to say how happy I am that you’re in that position. Thank you Alan. And I think that the reality that yes, I am a nurse practitioner, the first time that we’ve had a nurse practitioner president at NLA. But we’ve always also had pharmacists, we’ve had nutritionists, and this is the only organization I know where you can come right to the top because we all respect each other’s abilities. We have different agendas sometimes, but we definitely have the patient in mind. So, it is a wonderful opportunity. Yeah, and I think it enriches what we do, because we do have different agendas and many times you bring us physicians back to remembering other things that are very important in the care of patients that may not be in our wheelhouse and should be, and probably vice versa, right? Absolutely. I think the benefit of being a nurse practitioner is that I am halfway into the medical world and the other side into the nursing world. And bringing those two agendas together really allows for a patient-centered care. And, of course, that’s what we’re all striving for. And I do think that physicians look at the world sometimes differently, not so much here at the NLA because we are looking at prevention and we are looking at the same thing. But in a lot of ways, I think physicians have been trained, historically, to take care of things once they’re problems and we, as nurses, have always been the other side, you know, let’s prevent it. So, put it all together and we’ve got a great combination here at the NLA. Before we get started on the obesity discussion, I think maybe the listeners would be interested to hear what your goals are for this year, as president. Obviously, I realize that a lot of our audience are not lipidologists and not necessarily members of the NLA, though you’re all invited to join, but they’d probably be interested to hear from your vantage point what you want to accomplish this year. Yes, thank you for asking that, Alan. I actually have a very interesting kind of an agenda, and mine is to be a disruptor. And we, at the NLA, have had an opportunity over the last few years to really change our face in the lipid world with our Part 1 and Part 2 recommendations, we have really planted our feet firm and said, “This is the place to come for your lipids.” And I want to continue that disruption that we’re not specialists, but really, really work toward internally as well as externally being disruptive of ideas that may be incorrect, like maybe, certain things are for physicians and certain things are for the others. We are together. So, that definitely is one of the things that is very, very important to me. The other thing is to be outside of our organization and include other organizations. So many other like-minded groups really need to know more about lipids, and we want to invite them to be part of us. We realize they may not want to be members of the NLA, but they certainly could benefit from the education pieces and the work that we do. So, we really want to get out there and say, “Come on, talk to us and tell us what you need,” particularly women’s health issues, issues with OB/GYNs because I think that they are the beginning for getting lipids tested, I think rheumatologists. All the folks that we deal with in our own lives would benefit from some of the information we have, and we want to share. Well that’s terrific. I’m looking forward to next year under your leadership. 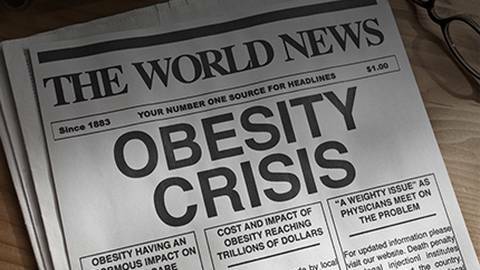 So, our discussion today, as you know, is going to focus on the obesity epidemic and what the clinician needs to know. This is a tough topic, because as I’ve joked about many times in the past, the problem with willpower is it has a half-life of 2 weeks and it’s soluble in alcohol. And I was just reading today why people give up on diets and people fighting weight loss and the data being a little bit discouraging on being able to maintain it. So, I wonder if you could tell me, first of all, a little bit of the scope of the problem, which I think we are all aware that obesity is an increasing area of concern—significantly increasing—but tell us what the real scope of the problem is and then we’ll get into the discussion of how we may tackle it. Yeah, the real scope of the problem, this is an epidemic that is not only in the United States any longer, but actually is pervasive around the world. The epidemic is based upon our lifestyle more than anything else. I really believe that the fact that we are in such a computer generation where families don’t get outside, don’t walk, they sit at home at night and play on their machines. I always think it’s incredibly funny when you see a commercial where four family members are sitting together in a living room and each one is on their own machine and not talking to each other. Same thing is we don’t go outside. We don’t get out and we don’t exercise. Children don’t go out and play like they used to, because they play in the house, by themselves, or reaching a friend. I think that this epidemic is because we also have such good food here. We have good food and we think that more is better sometimes. And when we want to change, it’s not only from the patient perspective or the person, because I do believe people want to change, but they read the wrong things sometimes. If you stay up late at night and you get all those channels where there’s four or five weight loss things that are going to change you and in 2 weeks you’re going to be in a bikini. And it’s just not reasonable. But people, because they don’t understand or know what to do, will reach out for anything. They will take medications, they’ll do all sorts of things and these fad diets can be very unhealthy. So, I think that it’s a big problem for them, but then as the provider, when your patient comes to you and says, “I’ve tried all these diets, I don’t know what to do,” what I have believed strongly is that the providers don’t necessarily know what to do either. And I think that just the acceptance of that, that we really don’t know all the answers, is the catalyst for change. And so what we have done here at NLA for a workshop at this meeting was have a group of people sit down and talk about this epidemic and how over 50% of our population is overweight or obese at this time. And for the first time in our history, we have children with type 2 diabetes. So, it’s a marker for what’s going on. Scary, though, is when I’ve talked to people who are really obese, and when they compare how they’ve lived in misery, feeling like they’ve been not able to get a job, they have been discriminated with, some people say, “I’d rather be blind than obese.” So, I don’t think we’ve taken it that seriously. So, as providers, we read the same things, we see the same commercials, but we don’t know. So, what we’ve done is we’ve put a little workshop together that we discuss the guidelines for obesity or the guidelines that are the newest one for weight management. Because that’s what it really is; it’s not diet, it’s management. And then we actually showed people how to get to talk to patients about this, because I think that’s what we need to know; how do I do it? I might know the information, but I don’t know what to do. Same way with changing of behavior. And so, we were changing behavior by doing adherence and physical activity. …was certainly a great accomplishment. Do you think that, I mean, since 1950 we have about 5 times the number of diabetics. It’s pretty striking, and I wonder sometimes whether our recommendations to reduce fat in the diet from the American Heart Association, going back many years, prompted everybody to read the labels and say, “Okay, there’s no fat in these no-fat cookies,” so they ended up filling in with carbohydrates and sugars, because there was just this gigantic ramp up. And the second thing, I think, is we’re victims of the post-9-11 generation and our worries about our children. So, when I was a kid, my mother would always say, “You can go to your friend’s house,” even at 9 o’clock at night, you can ride your bike across town, just be back in time to get to bed by 10:30. Now, we wouldn’t even dream of doing that, right? So, maybe we’re happy that our kids are sitting in the basement playing video games. So, it’s hard to know whose fault it all is, but what do you think about the dietary recommendations and their changes? I think that what happens with diet, of course, is that people, they don’t read the guidelines. We’re the ones who read the guidelines. We’re the ones who are the suggesters of what we should be doing. Many, many people never see us for that problem until they have a really large problem. So, I think guidelines are wonderful, and I think giving us ways to apply those guidelines is fabulous. I think our real problem comes from getting the folks in front of us so we can really do the magic. But you know, you talk about the children not playing outside, it’s so true. One, they’re sitting there playing their games, they’re also munching on potato chips. And so, that’s the etiology of this major, major problem. And you go to an airplane and they have extensions for people. You go to a ball park and a few ball parks have now changed their seating. You go to an airport to get on a plane, they’ve got wheelchairs that are one and a half sizes, to fit the population. So maybe we’ve just taken on an attitude of, “Well, I guess it’s okay,” and, of course, it’s not. If you’re just tuning in, you’re listening to ReachMD. I’m Dr. Alan Brown and I’m with nurse practitioner and the new President of the National Lipid Association, Joyce Ross. She is a consultative education specialist in cardiovascular risk intervention. So, Joyce, you didn’t tell me—I let you skirt that one question about whether the reducing fat and the carbohydrates, whether we’ve actually added to the problem, whether organized medicine maybe had given a little bit of the wrong advice instead of focusing on a little more protein and reducing saturated fat. But I’d be real curious what your thoughts are. Yeah, I think that the guidelines came along and told us not to eat so much fat, but they didn’t tell us to substitute it with carbohydrates. But what people heard, and what manufacturers of food heard, was let’s say no fat. So, we’ll add something else. It’s like taking the salt out of something, “Oh, I’ll add something else that’s equally as bad,” or taking sugar out. I think that the people who provide health have good intention, but I do think that our patients out there do not understand at all, they just hear low-carb, no-carb. And then, of course, we’ve had a few books that were written about the no-carb diets and the high protein diets and all those other diets. They all start with d-i-e, and I think there are things to avoid. And so, I think that it’s been a totally… you’re right that people just went all different ways because they didn’t understand. But today, I think we have the ability to teach people a little bit better. Maybe we should use those computers a little more for education and not so much for the use of just having entertainment. Yeah, and I think simple messages are the way you educate, right? And if you look across all the diets, it’s really determined by calories whether you get a result. No matter how you get those calories, it’s total calories. Right. And so, that’s one thing that we haven’t probably done a good job of having simple messages. You just need to restrict calories, and you will lose weight. And I have a lot of patients that think they have some disease where they are not eating anything and they don’t lose weight, and I explained to them that doesn’t happen. There is no such disease. Yeah. We have a method that’s called Simple. And if you simply reduce your weight by 5-10%, and we know this through literature, that you not only reduce your weight, you reduce your glucose, you reduce your cholesterol, and you are overall much healthier. So, I think that we’ve given the wrong message which steers our patients away again, that you have to lose 50 pounds. No you don’t, you have to lose 5%. 5% of your weight, and let’s just say that, for a number, is 10 pounds. Well, you can lose that, but do it in six months. There is no quick fix. You didn’t gain it overnight and it’s not going to disappear when you’re sleeping. Very good point, and I think the Diabetes Prevention Project showed us that if you had impaired glucose—not diabetic, but pre-diabetic blood sugar—5-7% weight loss reduced your chance of developing diabetes by almost 60% over the next 5 years. Patients do respond to that message, so I think that’s an excellent point. It’s a simple message, and it works. So, we’re about out of time. If you were going to give our audience maybe 2 or 3 pearls about where to start, and let’s assume that your initial statement is correct, that physicians aren’t well-versed in what to tell their patients, what would be the 2 or 3 things that you would tell them to start with when counselling patients to lose weight? I would start with finding out if they know what they eat? Because our patients don’t realize what they eat. So, I would start out with a 2-day dietary recall. Have the patient write down before their visit exactly what they’ve eaten for 2 days and one weekend day also, and actually write down, then, the size of what you did. And then when they bring it to you, whether your nurse practitioner, or your nurse in the office, or yourself, is going to counsel them. Well, you add up all the calories, and then you look at a chart that tells you, for instance, on average a 50-year-old woman normally would have 2000 calories a day, normal, with normal activity of 20-30 minutes a day. And you find out that she’s eating 3000 calories on most days of the week. Well, there’s where you’re getting your weight from. And the major thing is to take a look at that list with the patient and say, “What can’t you live without?” And so, you say, “Okay, we’ll leave that in there, but how about half of that?” And then taking that diet, the things they like, the things that work for them and their family, and cut it down to the calories that are important. And the other message would be strong: get up and move. Great. Thank you very much, Joyce. Thank you for being with us today. It’s unfortunate we ran out of time, this is an important topic that we could spend a lot of time talking about. Hopefully we will again in another interview. I’m Dr. Alan Brown. You’ve been listening to Lipid Luminations, sponsored by the National Lipid Association on ReachMD. Please visit ReachMD.com/lipids where you can listen to this podcast, as well as others in this series. And please make sure to leave comments and share. We welcome your feedback. Thank you very much for listening to our show, and I’m your host, Dr. Alan Brown. You’ve been listening to Lipid Luminations, produced in partnership with the National Lipid Association and supported by an educational grant from AstraZeneca. To download this program and others in this series, please visit ReachMD.com/lipids. That’s ReachMD.com/lipids. NLA President Joyce Ross discusses novel efforts on behalf of the NLA to help combat America's obesity epidemic. Host Dr. Alan Brown welcomes Joyce Ross, nurse practitioner and President of the National Lipid Association. Joyce is a consultative education specialist in Cardiovascular Risk Intervention with the University of Pennsylvania Health System. She is the first Nurse Practitioner elected as President of the NLA. Ms. Ross introduces her goals for the upcoming year, including novel efforts on behalf of the NLA to help combat America's obesity epidemic.